I've heard from a number of people that say they find it odd that Houdini celebrated Christmas. He was after all the son of a Jewish Rabbi. Yet, he clearly did have cards/postcards that wished people a Merry Christmas. He married Bess who was Catholic and she no doubt celebrated Christmas. While scouring through hundreds of newspaper articles over the last few days I saw something kind of interesting. I found brief write ups in the theatrical section of newspapers during the month of December about who was going to be appearing at the local theatres. Apparently the crowds were traditionally low because of the holidays. Guess who was always working during the holidays? Houdini! And several papers mentioned that Houdini would be very helpful to bring in people. He was a guaranteed draw. Christmas has always been a duel holiday from what I have discovered. Originally meant as a day to celebrate the birth of Jesus, the day also fell upon existing celebrations by different cultures. These various traditions merged into one holiday called Christmas but there appears to be a religious celebration and a separate cultural celebration. For Christians the holiday involves all the traditions, the celebration of the birth of Jesus, the Christmas Tree, Santa Claus and so forth. For non-Christians, they may also enjoy various parts of the holiday like Santa, the Christmas Tree, decorating, exchanging of gifts and so on but not observe the religious aspects. One thing very interesting about the holiday is it's always been wrapped up in controversy. First, the early Christians were actually against it. The holiday was even banned in parts of Colonial America. Today, we find political correctness and Christmas not mixing too well. Some groups and individuals have complained about having the word Christmas used on govt. calenders, others want Nativity Scenes banned on government property. Some groups even want to ban Santa Claus, though in his modern incarnation he is hardly a religious figure. And others have actually pressured retailers to remove the word 'Christmas' from displays and advertisements. Apparently it's ok at the moment to use the words 'happy holidays', at least until someone complains about that. Oh, and then there are a few christian groups out there actually still protesting Christmas because it isn't in the Bible, so it should not be celebrated. It's gotten a little ridiculous if you ask me. But as I mentioned, Christmas has carried a bit of controversy with it since the beginning. 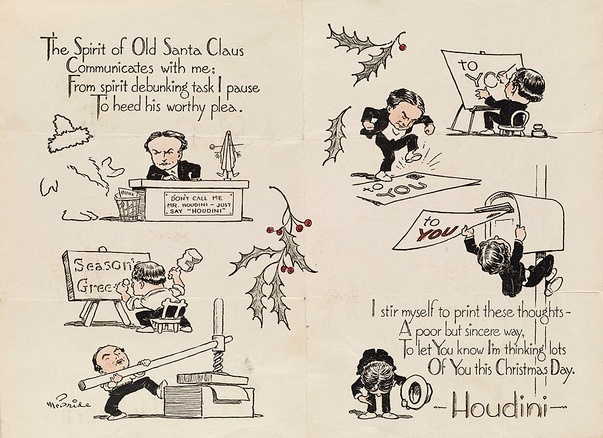 My guess is Houdini enjoyed the secular side of Christmas. Believe it or not, there was a time when saying 'Merry Christmas' to someone was just considered a pleasant greeting. Sending Christmas cards and notes has always been known as a gesture of kindness and friendliness. I tend to think Houdini stood on the side of "Peace on Earth, Good Will Towards Men" which is a good sentiment any time of year. So to all my readers out there, Merry Christmas! And if you celebrate a different Holiday, may those celebrations be joyous as well. And if you don't celebrate anything, Happy Nothing, I guess, lol, or better, have a nice day! Nice post. There's also a shot of Houdini, Bess, and his assistants beside a Christmas tree inside (presumably) 278. They celebrated Christmas. OMG, that's so funny you should mention that. Because I also put that in the article!